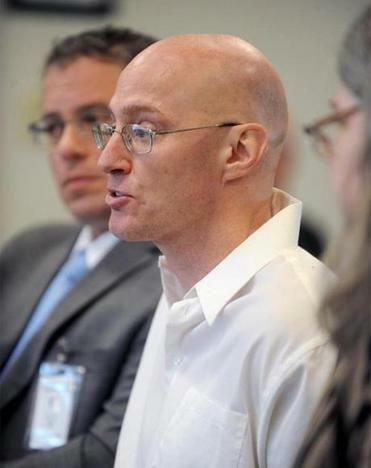 Rod Matthews spoke March 29 at his hearing before the Massachusetts Parole Board. Matthews was denied parole for the third time and must remain behind bars for five years before again seeking parole. For the third time, teen killer Rod Matthews was denied his freedom by the Massachusetts Parole Board, which ruled he must remain behind bars for another five years before he can ask again for release from state prison. Matthews was 14 years old on Nov. 20, 1986, when he convinced Canton High School classmate Shaun Ouillette to follow him into a wooded area, where he beat the 14-year-old to death with a baseball bat. The boy’s body was discovered there by searchers three weeks later. During those three weeks, Matthews twice brought friends to view the body. Matthews was 15 when he was convicted of second-degree murder as an adult and given a life sentence with the possibility of parole, one of the first juveniles to be given an adult life sentence in Massachusetts. Earlier this year, a now-bald Matthews appeared before the board for the third time. He apologized for murdering Ouillette and asked for his freedom, a request opposed by Ouillette's mother, Jeanne Quinn. She told the board she forgives him but believes he is still prone to violence. In a five-page decision made public Tuesday, the board unanimously concluded Matthews should remain in prison for at least another five years. But James Alan Fox, the Lipman Family professor of criminology, law, and public policy at Northeastern University, on Tuesday lamented the board’s rejection. Fox knows Matthews, testified in favor of his release, and argued for his release in his own Globe piece. He said parole should be based on the crime itself and on what the inmate has done since committing it. In Matthews’ case, he said, the change he has undergone is not being properly recognized. While acknowledging that Ouillette’s mother is an articulate voice for her murdered son and has every right to oppose Matthews’ release, Fox said the board must also give significant value to what he has done to rehabilitate himself. He also said that because the crime was high-profile, so too are parole hearings, a factor that works against Matthews because it has a chilling effect on the board.